I had so much fun nesting and preparing for James Walker. 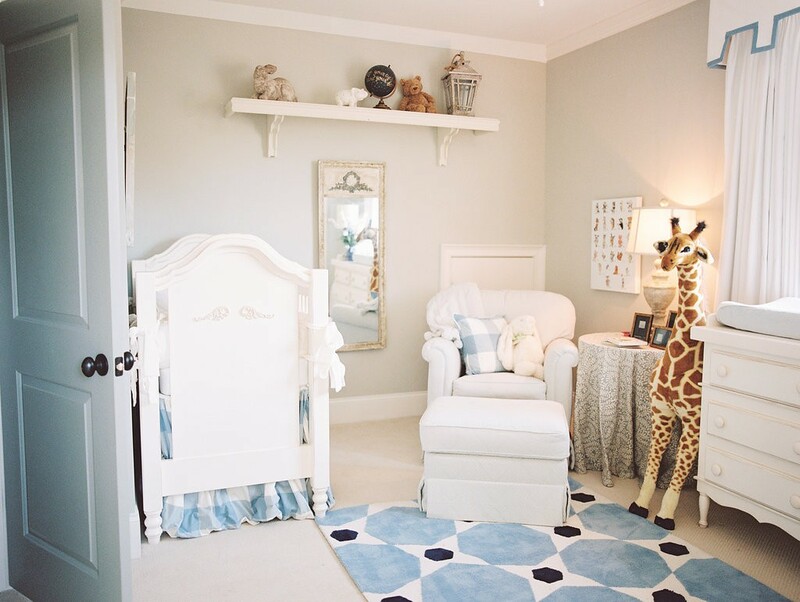 We moved into our house in December 2013 and this room was Hayes’s room. We never decorated it, though, because he was still in a crib and we knew he’d transition to a big boy bed soon anyway. And then I got pregnant with James Walker, so Hudson and Hayes moved in to a shared brother room and this room became the nursery. We had all of the furniture, so it was great that we didn’t have to make any big purchases. 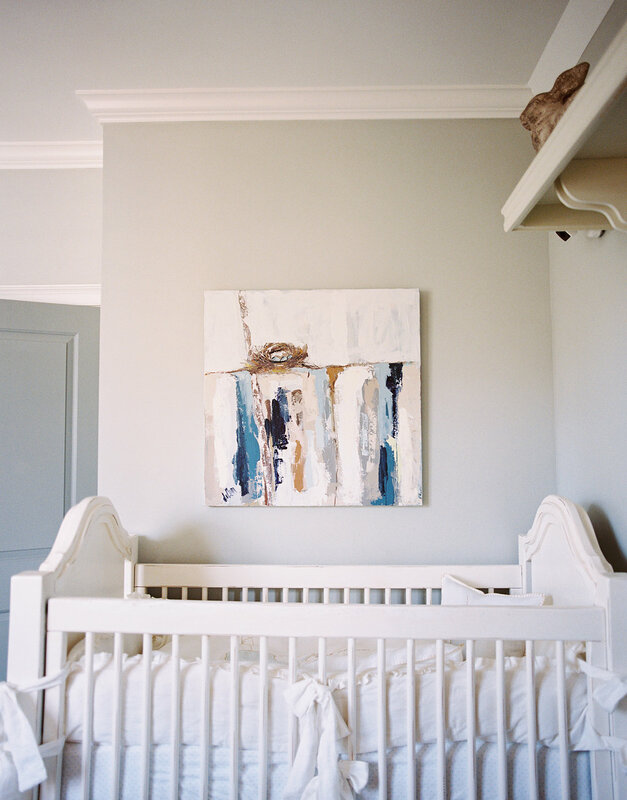 I chose a simple, soft color scheme because I just love blues and wanted a soothing nursery. I wanted a lot of linen and pale blue with some fun pattern mixed in. The rocking chair was the same chair we had for Hudson and Hayes, but I got some great fabric from Fabric 101 here in Columbia for $8 a yard during an after-Christmas sale and had the chair and ottoman recovered. A local friend of mine recently moved and was selling some of her home accessories, and she gave me the table skirt and I bought the table lamp and trumeau mirror from her for a steal! 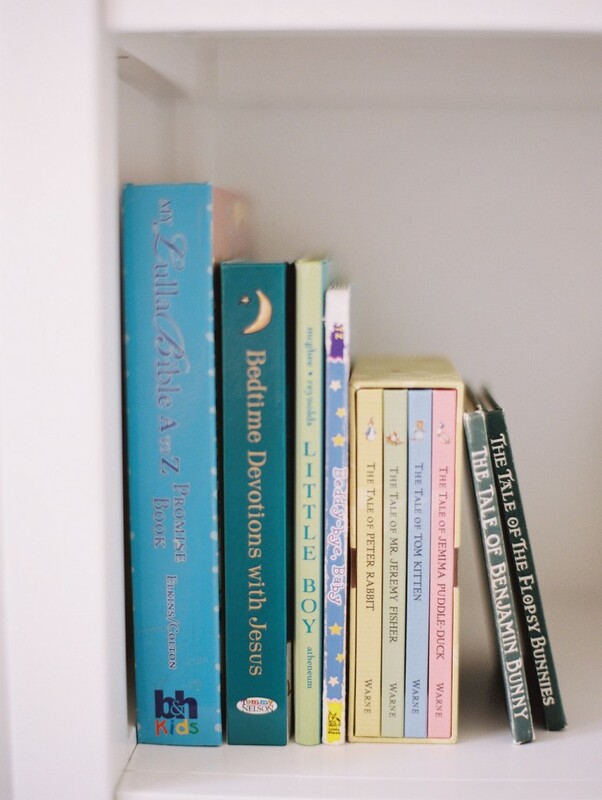 The shelf on the wall was in Hudson’s room and before that it was in our study before Hudson was born. I bought a set of three of those from Ballard Designs right after Todd and I got married. I did get all new crib bedding. My dear friend, Nina, was selling her white linen bumpers and crib skirt and it was exactly what I wanted for the bumpers, so I bought those from her. And I had the buffalo check crib skirt made from beautiful fabric from Calico Corners. The “little boys” sign is from Aedriel and House of Belonging. I originally bought that to go in the playroom, but the more I looked at it, I knew it had to go in James Walker’s nursery. Maybe someday all three boys will share a bunk room and it can go in there! 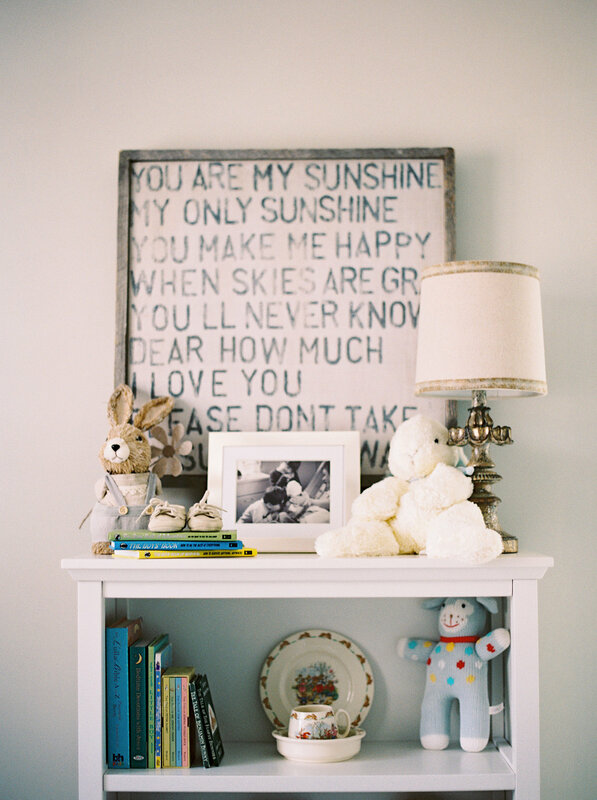 The You Are My Sunshine sign was in our guest room in our old house and it is from Sugarboo Designs. I love seeing those lyrics on the wall. It’s impossible not to sing along! The nest painting was something I’ve wanted forever and it was a gift to James Walker from my mom. The artist is Deann out of Nashville- she’s incredible! On the shelves, we used a lot of things that were mine or Todd’s from our childhood. 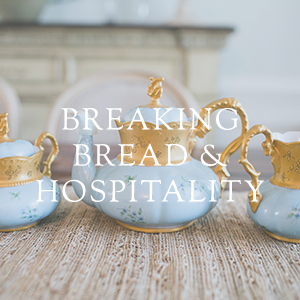 Books, Bibles, Beatrix Potter plates and piggy banks. 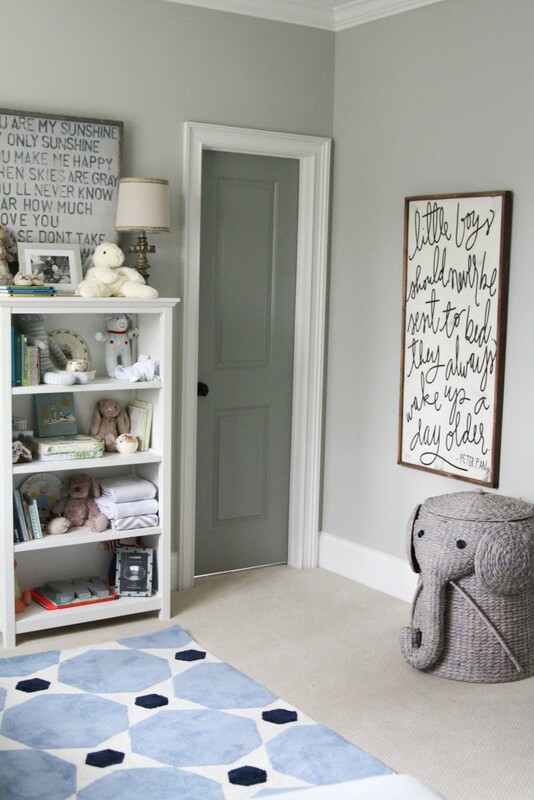 It was fun to take things we already had and move things around to create his nursery. I absolutely love sitting in this room and feeding and rocking my sweet boy. I hope he has many sweet dreams (and good sleep!) in this room! I have been pinning nursery ideas like crazy and shopping around for unique pieces. 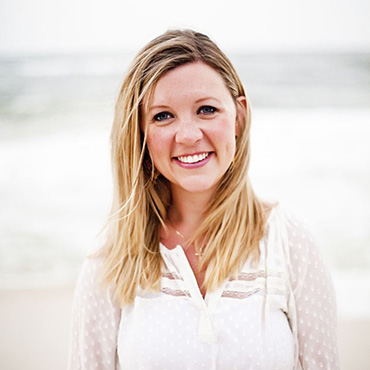 (Are you following me on Pinterest?) It has been so much fun to start working on another nursery! 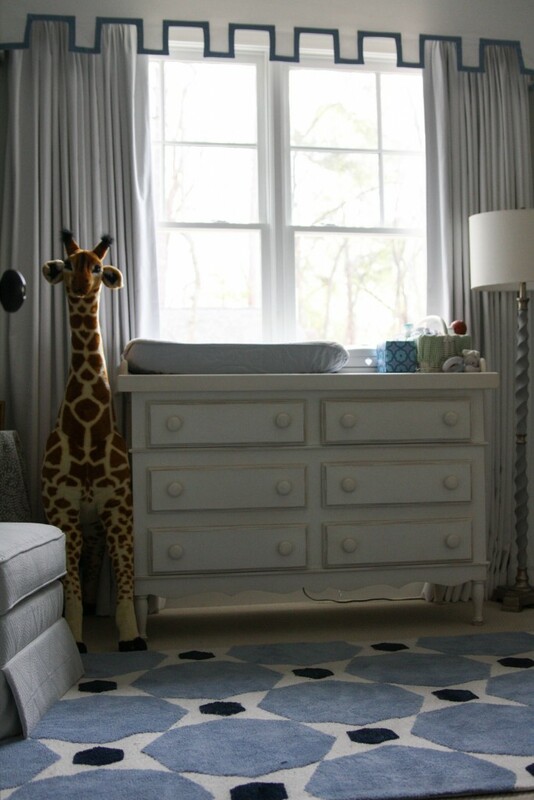 When Hayes was born, we moved him into the nursery we decorated for Hudson and moved Hudson to a new big boy room. 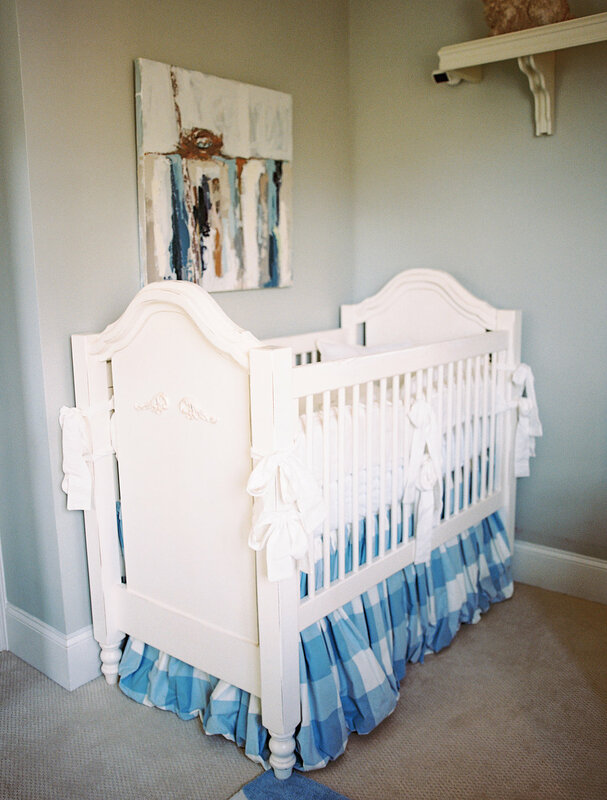 When we sold our old house, we sold the custom draperies that were in the nursery and I don’t have the crib bedding that Hayes and Hudson used anymore. But I still have all the furniture, which is a huge blessing. We’ll recover or slipcover our rocker and just touch up the paint on our changing table and crib. (Hudson and Hayes both chewed on the crib when they were teething!) We don’t need to get much at all! But it has been fun to find new things to personalize the room like lamps and crib bedding, a pillow for the rocker, mobile, and the J.M. 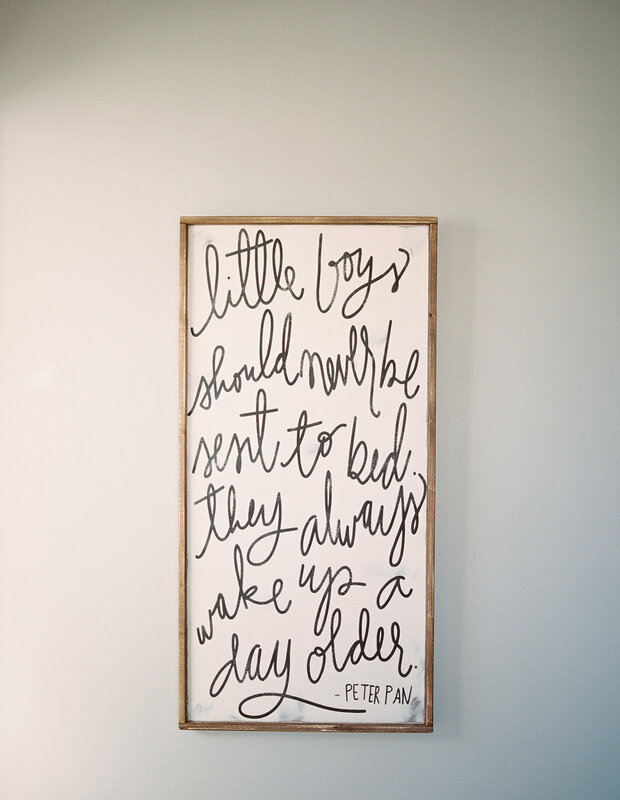 Barrie “Peter Pan” quote. I also have an antique trumeau mirror that I’m so excited to put over the changing table so baby boy can see himself in the mirror. I still can’t believe we’ll have a baby here again! 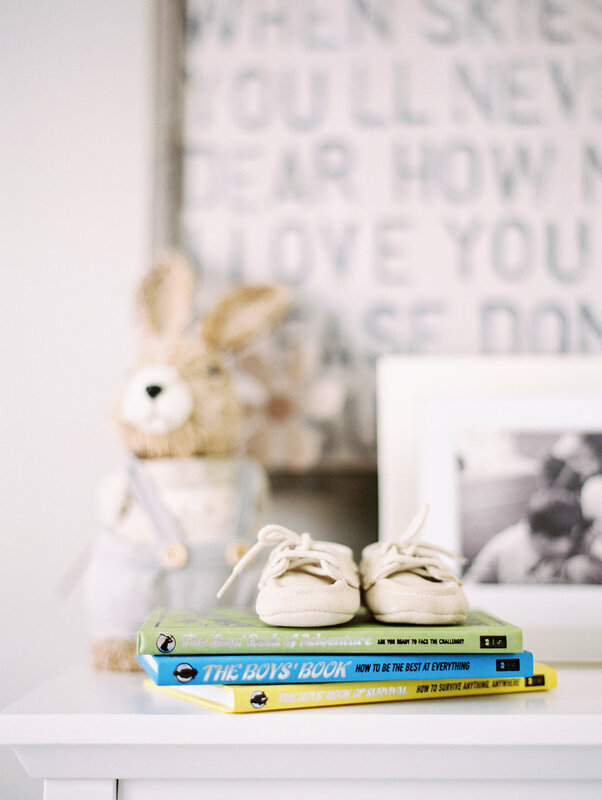 Hudson and Hayes’s nursery was bright and cheery and I loved it, but for our third baby boy I wanted to do something a little bit different and a little more my style. I want it to be calming and peaceful with sweet “baby” touches. I also plan to frame and hang some sweet newborn photos after he’s born. Now we just need to get to work and get the room ready! I can’t wait! Welcome to our kitchen! I decided to continue with our home tour with the busiest room in our house. We had so much fun planning our kitchen. I wanted openness and I wanted really functional storage. The biggest way we achieved more storage in an average size kitchen was to use more deep drawers instead of cabinets. We only have lower cabinets underneath the rangetop. Everything else is deep drawers. 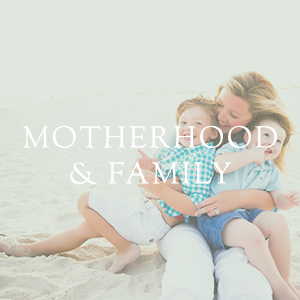 We keep our pots and pans, lids, baking dishes, sippy cups, and really every single thing in the drawers. We did one cabinet for huge items like our roasting pan, cake plates and one huge boiler I have. The kitchen is open to the family room, and I know this isn’t for everyone, but it has been so great for us. In the last house, the galley kitchen was really far from the family room, but people still wanted to gather in the kitchen. There just wasn’t anywhere for them to sit. I love that in this house, everyone can be together and still have plenty of room to spread out or watch the game. Cooking dinner at night has gotten so much easier just because the kids aren’t constantly calling for me, and I can see them. We decided on a microwave drawer and have really loved it so far! I love that if something is heavy or hot, I’m not trying to pull it down from above. Thanks to Pinterest, choosing our kitchen finishes was a lot easier than I thought it would be. There are so many beautiful kitchens out there. Antiqued cabinets. All gray cabinets. Dark cabinets. White cabinets. How could I possibly choose? It’s all so beautiful! But when I looked at my kitchen board on Pinterest, it was obvious was my style was. 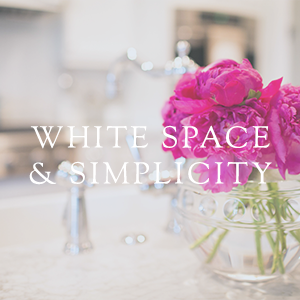 Every kitchen I had pinned was white cabinets, white subway tile, and a light counter top. Despite second-guessing myself and its practicality for a few months, we finally decided to go with carerra marble counter tops. I had heard that it was impractical and that they stain and scratch. But I didn’t care about the risks. I knew that I’d probably never get the chance again to choose my counter top, and marble was what I really wanted. And it was surprisingly affordable! And I have not regretted that decision once. We absolutely love our counter tops and haven’t tip-toed around them at all! Our mudroom, desk area, and laundry room are right by the back door on the way to the kitchen. That has helped us tremendously when trying to cut down on kitchen clutter. We still have clutter, but it stays off the kitchen counter top. I’ve included a source list at the bottom of this post, and I’m happy to answer any questions y’all may have. Wish you could all come over for coffee today! 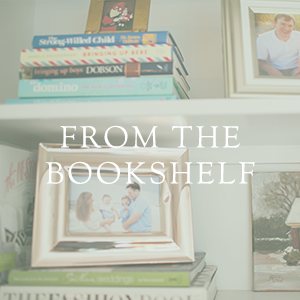 *There’s a giveaway at the bottom of this post for one of my favorite items in this room. 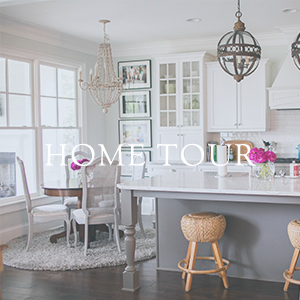 I thought I’d kick off the home tour with a really fun room that is fun for the whole family. The playroom is located around the corner once you get to the top of the stairs. We designed it on the plans like an upstairs den. It has three full walls, and the missing wall is open to the hallway that leads to the upstairs bedrooms and bathrooms. We love that it’s an easy place for all of us to sit and hang out while the boys play, and someday when they don’t really play with toys anymore, it can be a place for them to sit and watch TV or play video games (do they really have to grow up and do that someday? ha!) and hang out with their friends. I love that it’s not closed off and feels open and bright. The boys and I cleaned it up so we could take some pictures of it last week. It gets cleaned up every night before bed, but during the day you can imagine what it looks like. This storage system from Land of Nod was the only new thing we got for this room. 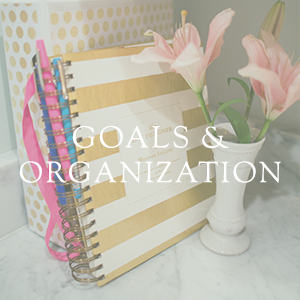 It is the perfect solution to tiny toys, books, movies, and really helps us stay organized. The polka dot rug was in the nursery at the old house and I love that we got to find a new home for it at the new house. And Truffles the dog was a baby present for Hudson when he was born. If you’ve been reading for a while, you remember this monkey from Hudson’s monthly updates. And the Happy Land pillow may be my favorite thing in the world! I got the pillow last summer when my mom and I were at market and I couldn’t wait to put it in the new playroom. Sweet little Fiona is my shadow, so it’s remarkable she only made it into one photo! The sofa was the very first piece of furniture we bought for our old house. It lived in our living room for five years and we moved it up to the playroom when we moved in here. It will probably need to be recovered someday, but it is so comfy. And it’s my favorite nap spot! The green glider was in the nursery at the old house, too. I like that we were able to have enough seating in the playroom for when we have play dates and a few parents are hanging out in this room. If you have any questions about the room, leave them in the comments and I’ll respond there. Okay, so now for the giveaway! You can find the Happy Land pillow at Heart & Home Collection. But one of you can win one by entering the Rafflecopter below!